Provide the drop-down list/list field with a title here. Click here for more information about defining titles. The title will be displayed in the edit field in the browser. The drop-down list becomes a mandatory field. 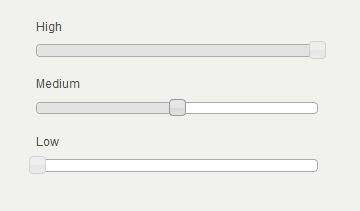 This setting will insert an empty entry in front of the other entries. Adjusts the width of the drop-down list to its surrounding elements. 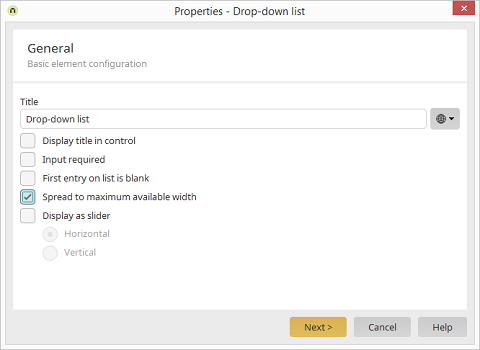 The drop-down list will be displayed as a slider in the end device. In so doing, the values that have been defined on the Entries tab will be used for the scale of the controller. You can also choose to display the slider either vertically or horizontally.